A place of unimaginable squalor; where man and dog co-exist in filthy, shared conditions. But as we looked around this fedit mess and as our senses were assaulted, we were left to wonder how the USPCA, the police and the USPCA vet viewed this scene. For us, this was a first. But for them this was not a unique experience where the issue of animal welfare is undoubtedly fudged by concerns about the living conditions of the keeper of the animals. Leading this expedition, were the USPCA’s chief executive Stephen Philpott and the society’s vet David Bailey – escorted by the local police of course. The owner gave the USPCA permission to enter his property and gave our camera crew permission to film the inspection about to take place. There were nearly 50 greyhounds on the premises along with seven horses. The USPCA had received a tip-off about this property – a place they had already been closely monitoring. What they found caused grave concern. The dogs were housed in cages inside the large barn-like building – although some were running in an adjacent field. But most troubling were the dogs inside what appeared to be an abandoned bungalow. Stephen Philpott got permission to inspect the house along with vet David Bailey. We simply followed them as the police remained outside. What awaited us was unremitting squalor. No home comforts here. Just dogs and their faeces everywhere. Watching our video of the premises will give you some idea of what I am talking about… but it will never let you experience the smell that lingered on my clothing long after I left for home. The floors were covered, inches thick in places, with dog dirt. And the smell was completely overpowering. Stomachs wretched and heaved. What saved me was the perfume scented paper tissue kindly proffered earlier by a colleague before we went inside. I stayed long enough to see that this did not happen overnight. This was an accumulation of dog dirt – some of the faeces covered by furry growths. And then in one room a chair and a television set. In another room a bed. It was only now I realised someone actually chose to live here. I was horrified to learn that the owner of the property was living in this house. Of course, this was his choice. Neither the police nor the USPCA had any jurisdiction over the owner’s right to live this way. They were here to look at the animals. 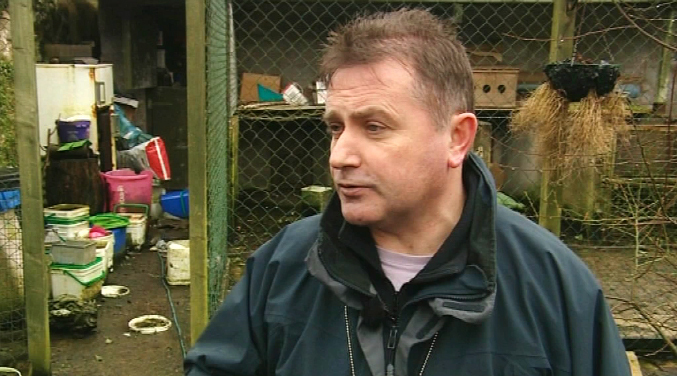 Vet David Bailey found three animals with wounds that he believed were the cause of suffering. But they were all he could declare to be in a state of suffering. He told me there was a very strong likelihood that given their present condition other dogs would suffer in the future. He wanted to remove all the animals but had no authority. Under existing legislation, covered by the 1972 Animals Welfare Act, only animals actually suffering can be rescued. But under the new Animal Welfare Bill, inspectors will be able to intervene and rescue animals not yet suffering but likely to in the future. In this case, the dog owner agreed he had too many animals and would give up most of his dogs and the horses. Stephen Philpott said that reaching such an agreement was the only solution possible given the limits of the law. However, when the USPCA arrived two days later to remove the animals the owner had done an about-turn. He refused permission to have them taken away.